She hums when she eats. She smells everything, including the tissue she used to wipe herself after using the potty. She likes to collect lint. She likes to drink homemade vegetable broth straight. She is easily distracted by talk about robots, dinosaurs (especially T-Rex) and Spider-man. This is the perfect time to comb her hair or brush her teeth. Nothing surprises me anymore. Remember this picture of her from about five months ago when she gave herself a hair treatment with her yogurt snack? I recall being so riled up by the mess. Now? That's child's play compared to some of the stunts she's pulled lately. We've reached the midpoint of the terrible twos and we're both still standing. I think we're getting the hang of this child/parent thing. As a matter of fact, I have found a way to turn her cutesy antics into gold. 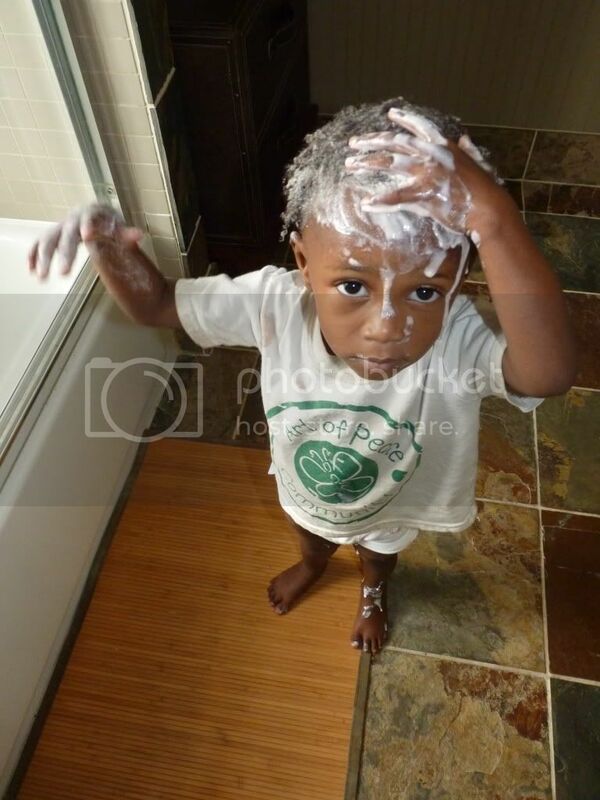 I submitted this photo to the Messiest Kid Photo Contest at Mom-Blog and it won! Marlie and Me earned a $100 Amazon gift card. We decided that we are going to spend some of it on her little brother or sister. Anyone watching the Oscars tonight? I am going to tune-in, but I doubt I'll be able to stay up to see the Best Picture award. This year, I've only seen one movie in that category, The Help. For some reason I have no urge to see the remaining nominated films. Entertainment Weekly has a great column making the case for why Bridesmaids and Rise of the Planet of the Apes (two movie I did see and enjoyed immensely) should have been nominated and how the Academy Awards have lost touch with the movie-going population. Congrats on the great win! I'm not much of an Oscar fan, I'll probably watch something I recorded on the DVR instead. Congrats on the win! That is funny that you can distract by bringing up certain subjects. I wished that worked here! Oh my goodness! What a big girl! That yogurt hair treatment is cracking me up. Totally something my toddler would have pulled. LOL! Congrats on the giftcard. I guess it was worth it right? I saw The Artist on our way back from Nigeria and it took 3 attempts for me to finish it (the silent aspect kept making me fall asleep! ), but I thoroughly enjoyed it and knew it would win. I'd love to see Chris Rock back hosting the Oscars. I like Billy but Chris is much more engaging to me. These Toddler Logs that you do are genius! Her little oddities are awesome and no surprises the picture won...so cute.